After the holidays, I just dread Winter. So right now I am so over Winter and its harsh, cold weather. I am already counting down the days to Summer. So to hold me over until Summer, my mind can only think about a warm-weather getaway. This girl is ready for vacation! I’m thinking beach, hanging out by the pool, and a whole lot of R&R. Doesn’t that sound nice?! Luckily, we will be going somewhere warm! With that said, I can’t help but think of vacation style outfits! Since I pretty much want to hangout by the pool or the beach, some cute swimsuits are a must! In my opinion, it is always good to bring more than one swimsuit. That way you don’t have to worry about your suit drying up quickly if you decided to hit the pool and/or beach multiple days in a row. I like to switch it up each day so I love a good one-piece and a bikini. How cute is the off the shoulder one-piece?! 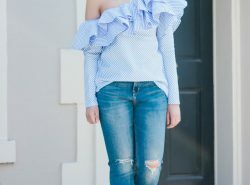 I’m obsessed and the ruffles just make it so much more feminine! Lately, I love anything scalloped! So when I came across the scalloped bikini, I knew it just had to be mine! Being in the sun means protecting your skin! I have issues finding a really good face sunscreen. The ones I’ve come across are always greasy, leave that white residue, and make me breakout. Lately, I’ve been into Korean skincare. I’ve been slowly converting my beauty products into Korean products. So when I found out that there are Korean face sunscreens, I knew it would be good! Are you guys going anywhere warm during the Winter? Love this Bikini and the off shoulder top is so pretty. I definitely would not mind a beach vacation right about now!! I'm not a fan of winter either and I love shopping for swimsuits! I am so jealous! I want warm weather again! Love the list! Love that off the shoulder one piece! How fun to be dreaming of your vacation to get through winter. Great selection!! #10 is really cute! Great pics! I love that swimsuit. These are such cute clothes! I wish I were going someplace warm soon! #1 is my favorite <3 So cute. Great selections, thanks for sharing! This post makes me head to a warm destination right now. I love it! Can't wait for the summer. love number 7! cute picks! Oh I love your style! Love everything on your list! All great picks! I am loving that OTS bathing suit!